Now I am ready to really start getting into the Dixon Ticonderoga. I want to know not only how well the Dixon looks and works but how well it is built and also how well is Dixon’s manufacturing process under control. Can I expect the same quality over and over again? Or did I have a fluke with my purchase? Could it have been better? Or could it have been worse? One way to see if a manufacturing process is under control is to measure the final product and see the ranges of measurements. Being small, physical, and simple, a pencil is an ideal object to measure. I will be using a set of generic digital calipers and a small digital scale. I pulled ten pencils from the box of 24. These ten are actually pictured in the last post. No consideration was given to any one pencil. I just counted them off and set them aside. First, let’s look at the weight. That’s easy. Each of the Ticonderogas weighed in at 5 grams. In theory, all 10 should weight 50 grams. My scale gave a reading of 49 grams when I weighed all of them. Being only one gram off is excellent. 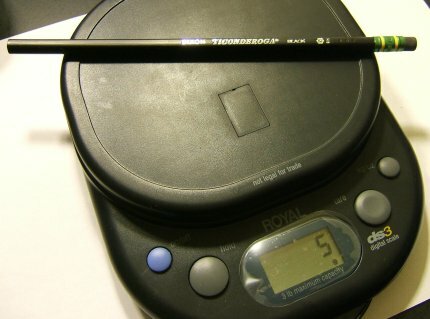 This could be due to rounding when each individual pencil was weighed. Perhaps each pencil actually weighed 4.9 grams instead. Eventually that 0.1 gram from each pencil added up to the one missing gram. Excellent! So far, so good! Now it is time to measure the pencils. This actually takes some time but it goes quickly. First, we need some definitions of the measurements I took. 1) Pencil height – lay the pencil down on one of its hexagonal sides and measure the height. It’s almost like measuring the diameter but diameter implies something to do with a circle. This pencil is not circular by the strictest definition. 2) Ferrule diameter around the crimp – self explanatory. 3) Ferrule length – self explanatory. 4) Eraser diameter – self explanatory. 5) Eraser length – self explanatory. Here is a picture of a Dixon with all the measurements marked. It’s probably pretty obvious that I am not a mechanical engineer by education or trade so you have to forgive me a bit for my crude markings. Now, here is a summary of the ranges of each measurement above. Here is a PDF with all of my raw data. I would like to stop here and dwell a little on what these measurements represent because I believe that they are really incredible. 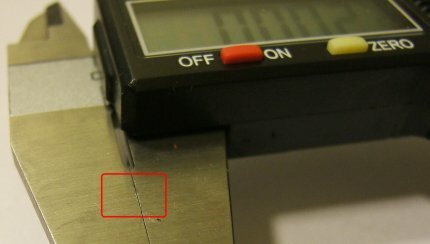 Frankly, I was very surprised at the consistency of the measurements. Look at the pencil height. 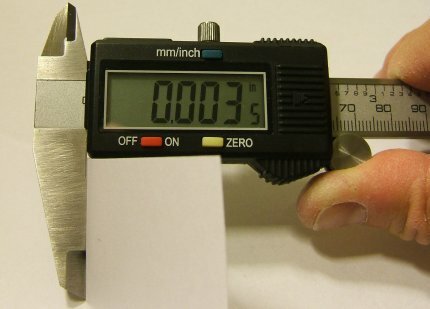 There is a range of 0.005″ between the smallest and largest numbers. That is an extremely tight range and this includes the cutting and lacquering processes! Consider this: a sheet of paper is about 0.003″ to 0.005″ thick! A human hair is somewhere around 0.005″ thick as well. I’m a guy so mine is pretty thin. Ask a supermodel who treats their hair like original Biblical manuscripts and you’ll get a thicker value. This tight range is something that is typically found in circuit boards and engines. I would never expect to see something like this in a pencil. 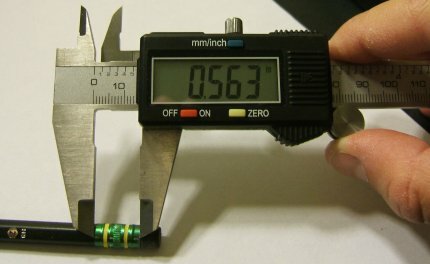 Even the ferrule length and diameter only varied by 0.005″ and 0.009″. Consider that these ferrules are crimped at high speeds with everything in motion. The eraser diameter range of 0.007″ reflects a good molding process. The measurements and ranges of the stamping are also good considering that this is a high impact and high speed process. Of course, these measurements are not definitive, are they? First, none of my instruments were calibrated and certified by any third party. I picked them up for cheap at outlets. At the very least, to be scientifically correct, I should have used three of each instrument to measure some constant and known value. But this brings up the second point. I only measured everything once! Ideally, I should have measured everything at least three times. This would have given me more confidence. But wait, there is more! I’m the only one doing the measurements. There should be a second person running everything in parallel to eliminate operator error in using the tools and making the measurements. So it is possible to shoot some holes in my numbers. That asides, I think these measurements, even at this amateur level, give a good indication that Dixon’s manufacturing process is stable and under control. Granted, there were some defects that slipped through as I saw in my first post but none of them were really show stoppers. Perhaps the warped pencil could be called into question but it would still be considered fully functional. I thought it was important to lay down these thoughts as a basis moving forward. These same ideas can also be applied to other things besides pencils. It can be applied anything that is manufactured. I love to pick on cars so I have to mention them in relation to the above. Have you ever checked the gap on each side of the hood or trunk? That’s an easy one to check. Just use your pinky finger. That is a great test on a used car to see if it was wrecked some time in the past and went through a body shop. Same can be done with door frames and windows – in a car or in a house!